Yes, yes--and yes! 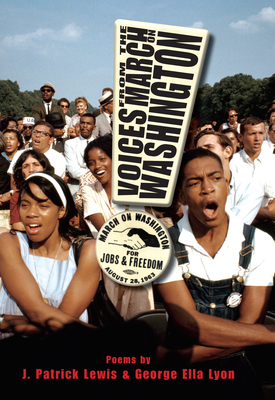 Yes, I do love VOICES FROM THE MARCH ON WASHINGTON--the poems, the handy "Who's Who" of civil rights in the back matter, and that first photo of the boy in the mirror sunglasses--instant impact. And YES to more picture books!! And YES to April's UCLA class! (April cares more about her students' happiness than any other writing instructor I know.) Wow, Laura: you covered a LOT here!!! J. Patrick Lewis is so clever! and so are you for organizing your reading! My favorite books to read are picture books and poetry too. I should join you in doing the twitter accountability thing. Janet, I can't wait to read the entire book. I know Pat's and George Ella's poems will be an experience and deserve a slice of quiet time from me. BJ, He is! His range is amazing, and he does social justice and history poems beautifully. I like the #bookaday, even though I don't converse that much. It still makes me think, "OOh, better read something now!" Wow, what a poem! Thanks so much for sharing it, Laura. I can't wait to see the book. Laura, Thank you for the ARC intro to this new one forthcoming from 2 authors whose sensitivity to soul & spirit catches me in the gut. This one by J. Pat Lewis is stunning. Thank you for the Sound Cloud reading (I learned about SC through Teaching Authors awhile back & don't go to it enuf - glad for the reminder. Do you have one from George Ella Lyons to paste in a reply comment? She is equally magnificient, remembering WHICH SIDE ARE YOU ON? Wish I were a pencil in a coffee cup at their table as they worked on this together deciding what to include. It must have brought out strong emotions. Triply important book, it looks, with photos from history illustrating. - thank you so much for the head's up. What an exquisite little poem by JPL! I look forward to reading more. And well done on your reading consumption, Laura- thanks for including some recommendations. Very powerful poem. I'll be looking for the book. I also loved Feathers: Not Just for Flying. Beautiful book. Wow! J. Patrick Lewis is a master of capturing the essence of his topic with exactly the right words. Thank you for sharing your recent reads. I see some intriguing titles on your list. Off to the bookstore! I agree, what a tremendous poem - powerful, yet subtle. Thanks for sharing it! Michelle, thanks! I'm not reading nearly as much as I want to, but I'm working on it! Rosi, I'll blog more about it closer to pub date to remind people:>) So glad you loved Feathers, too! Catherine, he is! Happy reading! It's intimidating sharing my recent reads--I don't usually show my Goodreads list because I don't want to insult the authors of the books I didn't love much, and also because I don't read many "literary" books, and it seems like everyone else does! Ah, well. Matt, glad you enjoyed the poem! I'm looking forward to reading more of your posts about this book. I'm going to check to see if it's on pre-order yet! Thanks for sharing it, Laura! Great post, Laura. The J. Patrick Lewis poem is a gem. My appetite is whetted. I look forward to reading the entire book. Thanks for sharing the poem by JPL and the one in the comments by GEL. I'm also very curious about the feathers book. It's so cool how this poem circles back on itself -- a pattern of balance. Two of my favorite writers on a vital topic--can't wait!